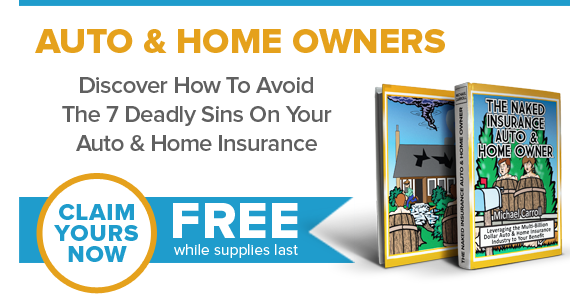 Don’t Get Fooled By The Latest Shiny Object For “Less Than” Protection On Your Auto & Home Insurance! For FREE Nationally Recognized Auto & Home Insurance Expert Michael Carroll will show you what REALLY WORKS in a power packed MUST SEE Video! Michael has spent the last twenty-seven years helping to protect Auto & Home Owners. He is nationally recognized as one of the leading specialists for Auto & Homeowners Insurance by identifying fatal gaps in protection that could ruin you and doing so at the best pricing. Hard working people are also busy people. They have a demanding schedule with families to support and care for. They don’t have time to micro-manage their insurance agent. They are looking for fewer headaches in their life, not more. At the same time, it was clear to me that auto and homeowners are all different and to insure them all the same would be at best lazy and at worst incompetent. It was also clear to me that there were situations that could very quickly put people in the “poor house” if he or she was not insured correctly. It was because of these possible dangers that I invested the time and effort to become schooled by my loss control/ underwriter mentor on every way an Auto and Homeowners should be insured. I committed myself at that point to give my future clients the very best that I could offer.